Turn the front individual map light switch OFF. Carefully pry off the lenses (A) with a flat-tip screwdriver. Remove the front individual map light (B). NOTE: When doing the front individual map light test, make sure to install the bulbs correctly. 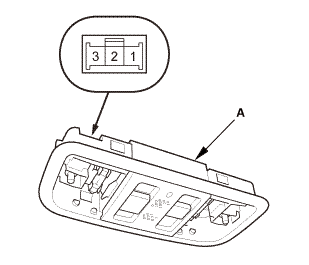 Check for continuity between the terminals in each switch position according to the table. 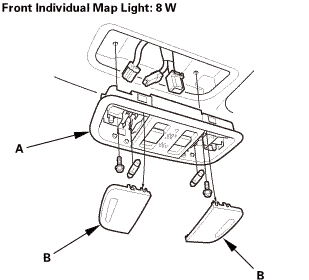 If the continuity is not as specified, replace the bulb(s) or the front individual map light (A). 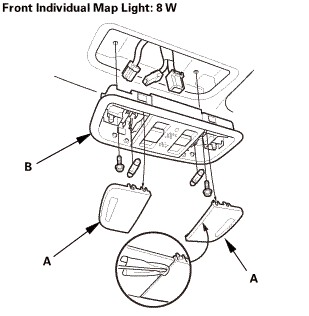 Install the front individual map lights (A). Carefully install the lenses (B).